The Gowanus Lounge: New Downtown Brooklyn Gallery Almost as Ugly as Old One? New Downtown Brooklyn Gallery Almost as Ugly as Old One? 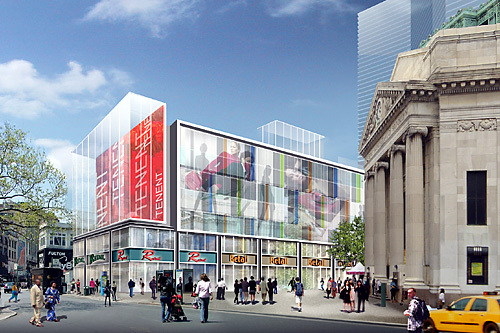 The new Brooklyn Paper has the rendering above of the New Look Gallery at Fulton Mall that is curiously minus the 45-60 tower that would go with it. The $750 million project, which would get a very, very big public subsidy, would have less affordable housing and several hundred fewer jobs than originally promised. That's a critical issue in its own right, but right now, we're simply staring at the rendering wondering how something so new can seem nearly as pedestrian as the thing it will replace. Maybe the 60 story building will help divert attention from it. Isn't that the tower seen rising in the back?